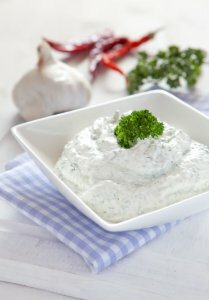 Our Garlic & Herb dip has a super depth of garlic flavour with plenty of oregano, parsley chives and thyme. A super allrounder popular with all the family, and perfect to keep a pack in the cupboard for any occasion. An all season dip ready to add flavour across the spectrum from cooked winter vegetable dishes to summer salads and sandwich fillings.